My most favorite thing about football season is the way that everyone and everything in our household slows down on Football Sundays. Instead of rushing around and running errands like we do during the rest of the year, on Football Sundays we lounge in our comfy clothes, sit by the fireplace (once it’s cold enough!) and cheer on our favorite teams. Friends and neighbors often stop by to chat and hang out, and we spend the afternoon having fun in good company. 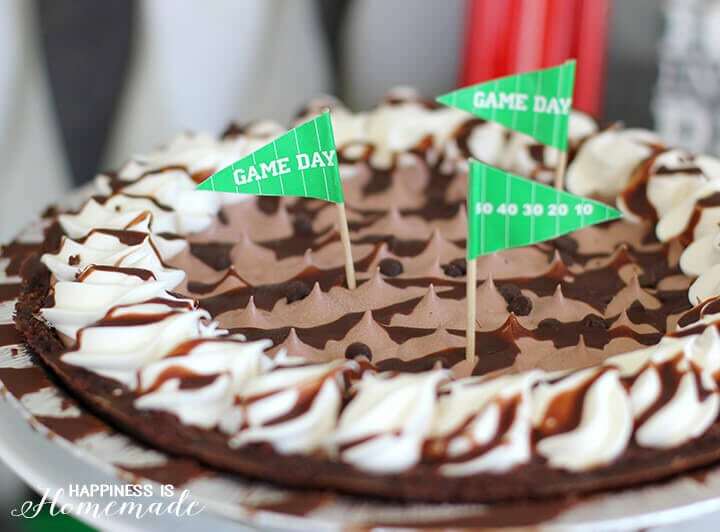 Football Sundays are worthy of a celebration, even if we’re just tailgating at home! 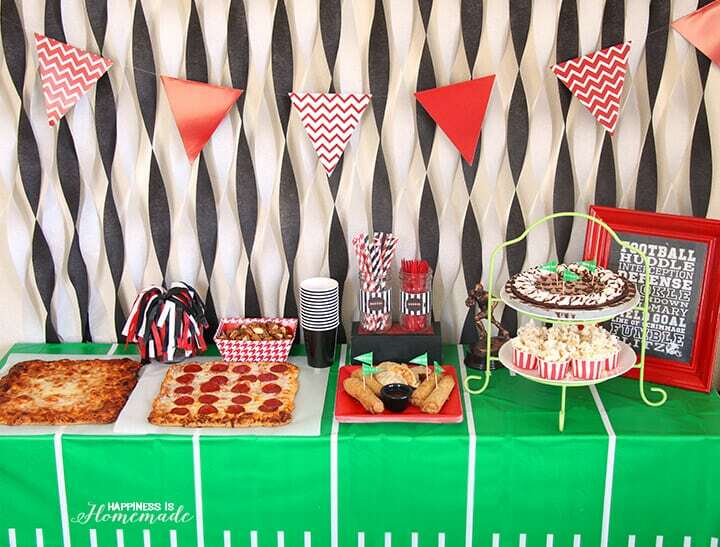 While I was shopping at Walmart the other day, I saw a specially marked “Tailgate at Your Place” package of Freschetta pizza in the frozen pizza aisle, and it sparked an idea…why not throw a Tailgate at Home party and add something special to our next Football Sunday? Plus, I couldn’t pass up the opportunity to enter to win $100,000 in prizes from the specially marked package! 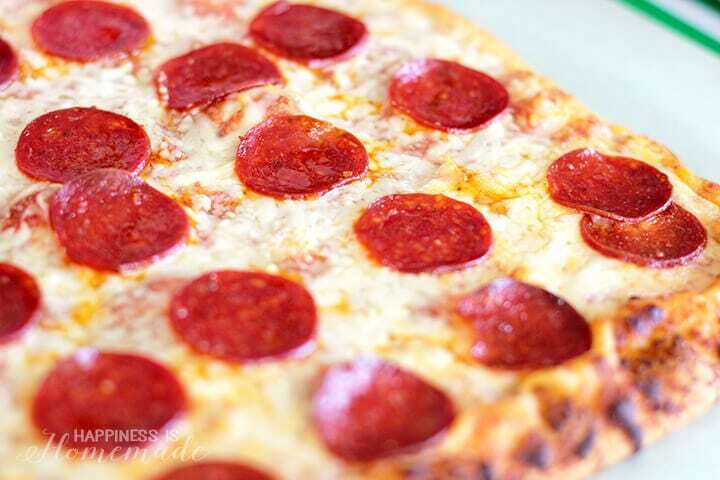 I picked up a Freschetta Brick Oven® Pepperoni & Italian Style Pizza, Freschetta Brick Oven® 5 Italian Cheese Pizza, Freschetta® Naturally Rising 4-Cheese Medley Pizza, an Edwards chocolate pie and a couple of Pagoda snack products. 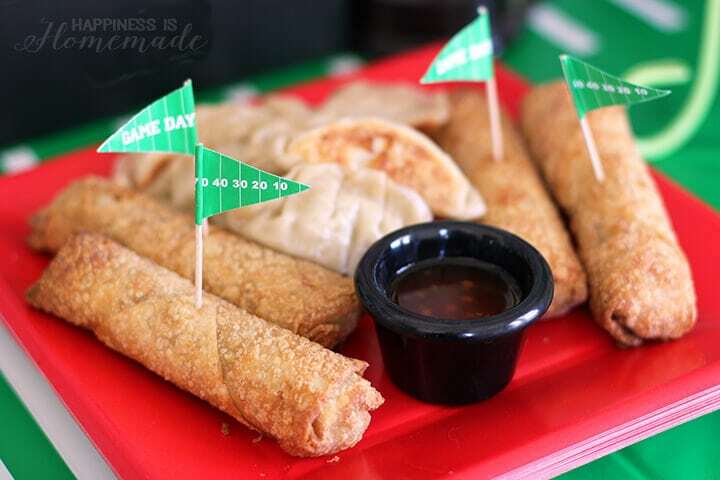 Tailgating is all about munching on your favorite comfort foods, right? 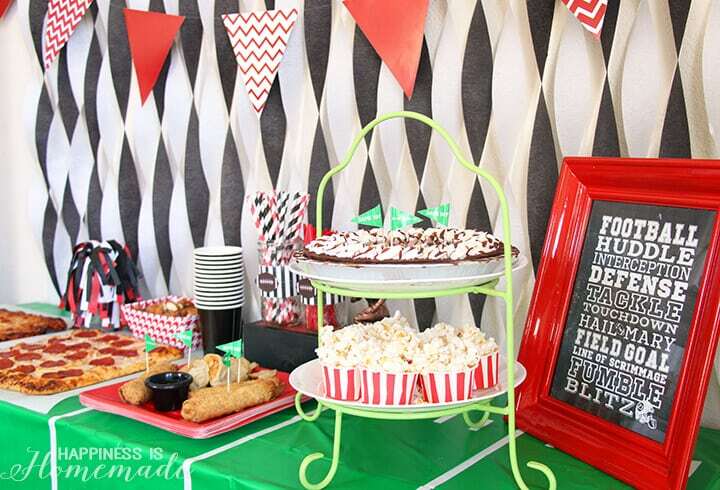 With these frozen goodies, a party-worthy food spread is just a few minutes away! 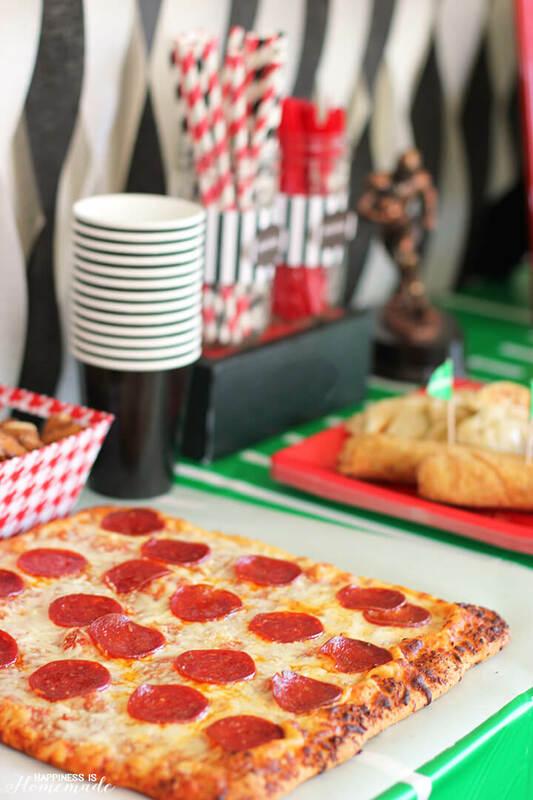 Freschetta pizzas are my family’s favorite for at-home tailgating because Freschetta’s uniquely made pizzas deliver a superior taste that really satisfies. They start with crust that’s made like fresh baked bread using only natural yeast and no chemical leaveners. 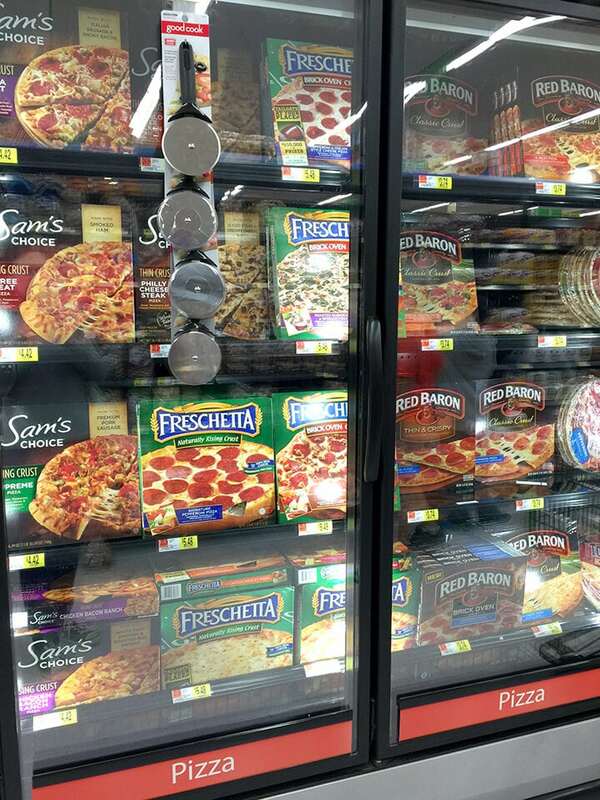 Then Freschetta tops their pizzas with only the most premium and high quality ingredients including sauce made from real tomatoes and 100% real cheese. Yum! 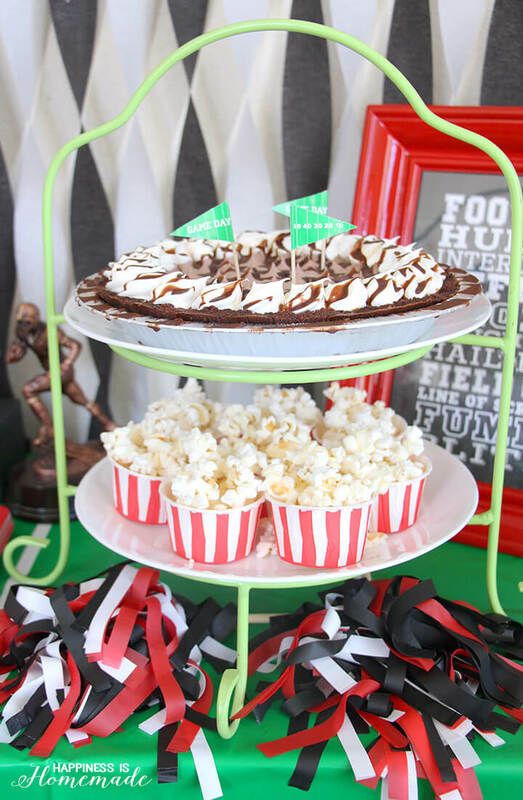 This framed football printable from Three Little Monkeys Studio adds the perfect finishing touch to the party table! 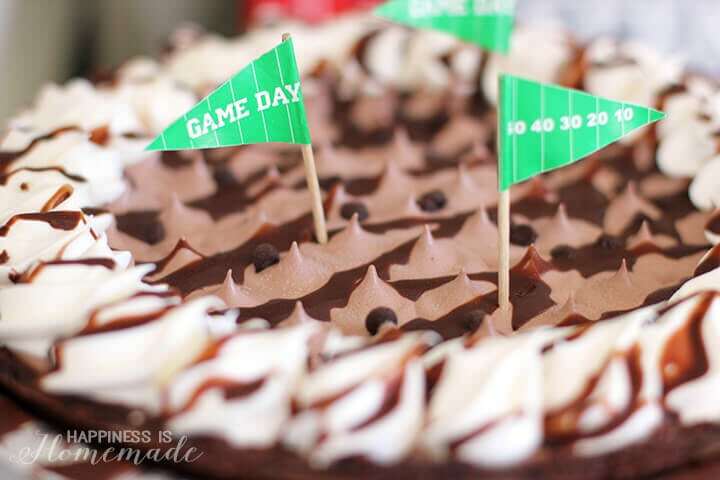 These “Game Day” food picks are pretty cute too, don’t you think? 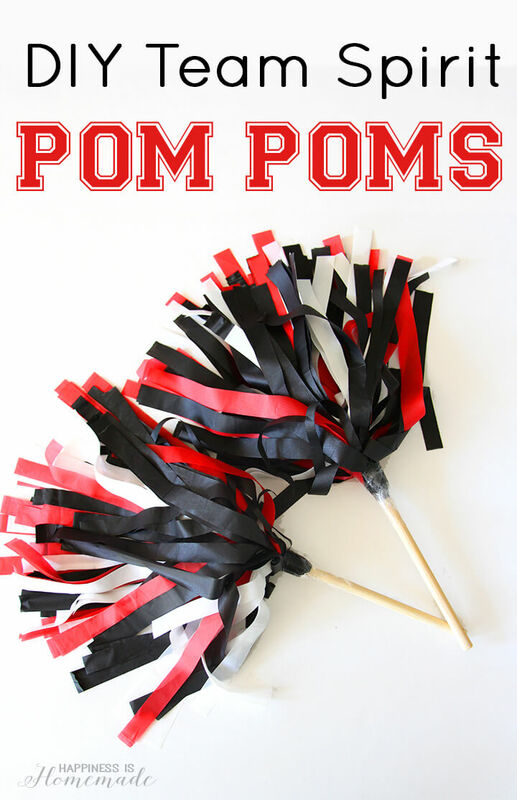 Our parties almost always include an interactive craft activity, and at our tailgating party, our guests made DIY Team Spirit Pom Poms in their favorite team colors. Unroll the tablecloth, but DO NOT UNFOLD IT all the way! The tablecloth comes pre-folded, so unroll it into one long piece that is around 14″ x 108″, but keep the remaining layers folded. Re-fold the tablecloth in half by matching up the short sides, and then fold in half again. You will be left with a thick sheet of tablecloth plastic that is around 14″ x 27″. Use the scissors or rotary cutter to cut the tablecloth in half both vertically and horizontally. You will then have four stacks of plastic approx 7″ x 13″ and each stack will have approx 12 sheets of plastic in it. Use the scissors or rotary cutter to cut each 7″ x 13″stack into 1/2″ wide ribbons that are approximately 6″ long (leave an inch along the end uncut!). Layer 8-10 fringed sheets of plastic in coordinating colors and tape the wooden stick handle to the corner of the uncut portion of the plastic. Continue rolling the plastic sheets around the wooden stick, and use strong tape to secure the ends and hold everything in place. 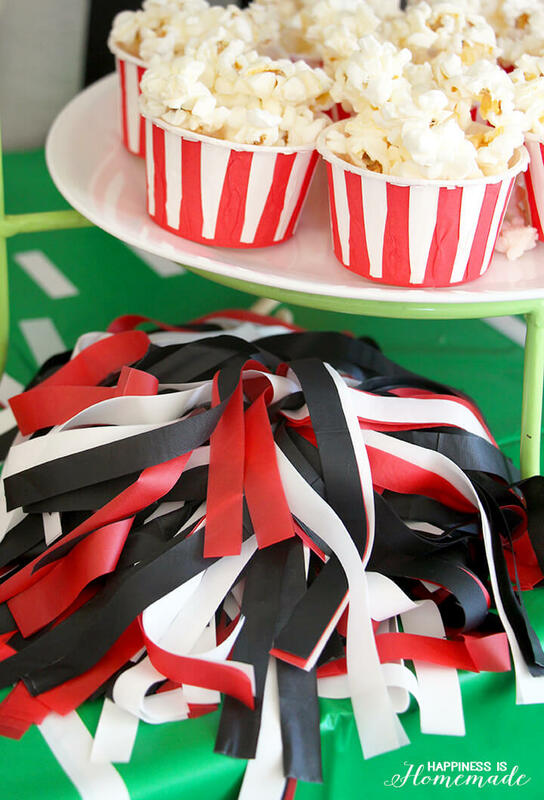 DIY pom poms are a ton of fun for kids and adults alike, and they make cute party table decorations, too! 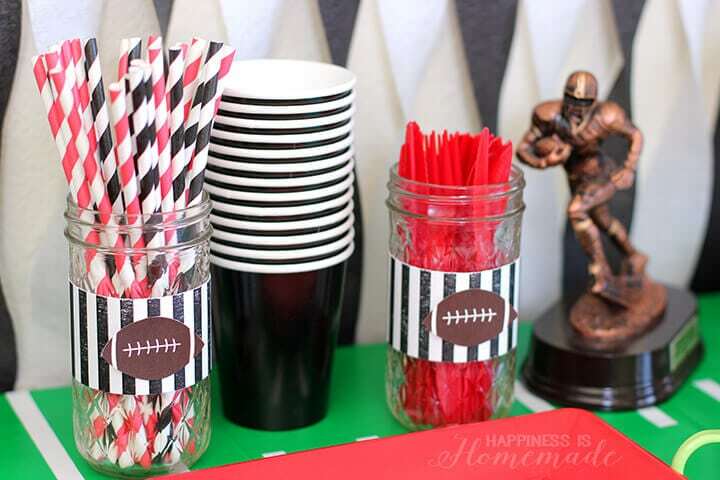 Football Sundays are even more fun when you Tailgate at Your Place! 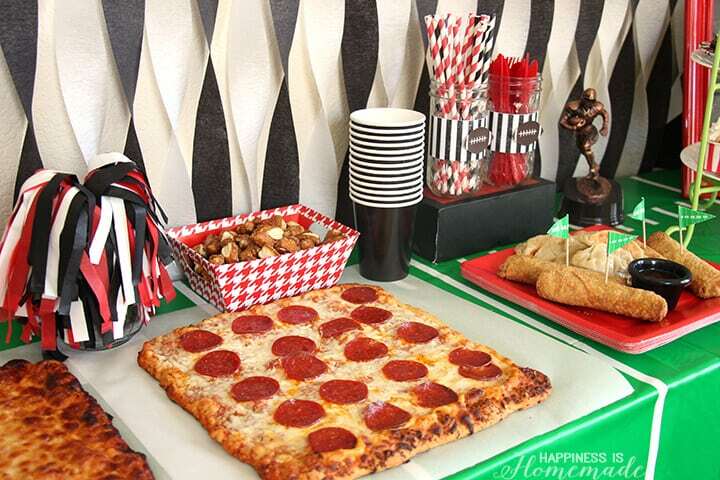 Don’t forget to enter the Tailgate at Your Place Sweepstakes for your chance to win $100,000 in prizes! 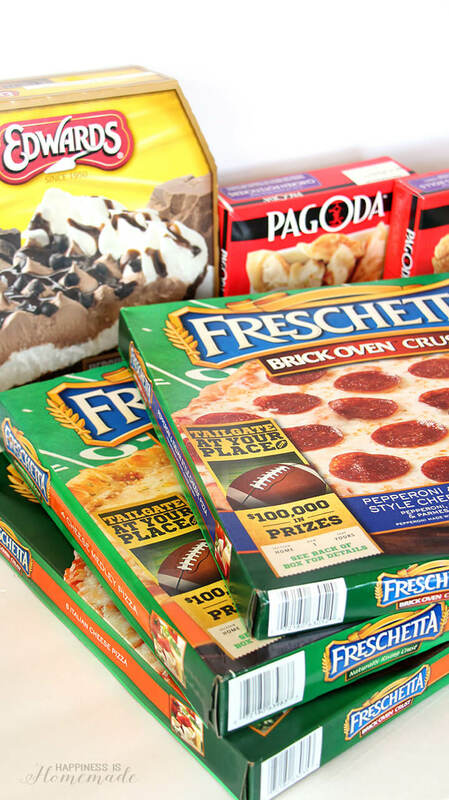 To enter, simply purchase specially marked Freschetta pizzas, and enter your code online to see if you’ve won. Some of the prizes include a $2,000 electronics shopping spree, Visa gift cards and pizza prize packs.